6:1 "Take heed that you don’t practice your tzedakah (charity giving) before men, to be seen by them. Otherwise you have no reward from your Father in heaven. 6:2 Therefore, whenever you contribute tzedakah, do not sound the shofar before you, as the tzevuim (hypocrites) do in the synagogues and in the streets, that they may have glory of men. Amein I say to you, They have their sachar (reward). 6:3 But when you contribute tzedakah, do not let your left hand have knowledge of what your right hand is doing. 6:4 that your tzedakah may be in secret; and your Father who sees in secret will Himself reward you openly. 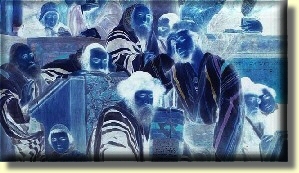 6:5 "And when you daven (pray), you shall not be like the tzevuim (hypocrites). For they love to daven (pray) standing in the synagogues and on the corners of the streets, that they may be seen by men. Amein, I say to you, they have their reward. 6:6 But you, when you pray, go into your inner room; and when you have shut your door, pray to your Father who is in secret. And your Father, who sees in secret, shall reward you. 6:7 And when you are praying, do not babble on and on like the Gentiles; for they think they will be heard because of their many words. 6:8 Be not you therefore like to them: for your Abba knows what things you have need of, before you ask him. 6:10 Your kingdom come, Your will be done on earth as it is in heaven..
6:12And forgive us our debts as we also have forgiven our debtors. 6:14“For if you forgive others their transgressions, your heavenly Father will also forgive you. 6:15 But if you do not forgive others, neither will your Father forgive your transgressions. 6:16 “And whenever you fast, do not become sad-faced like the hypocrites, for they neglect their faces to make their fasting evident to men. Amen, I tell you, they have their reward in full! 6:18 so that your fasting won’t be evident to men, but to your Father who is in secret. And your Father, who sees in secret, will reward you. 6:19 “Do not store up for yourselves treasures on earth, where moth and rust destroy and where thieves break in and steal. 6:20 But store up for yourselves treasures in heaven, where neither moth nor rust destroys and where thieves do not break in or steal. 6:22 “The eye is the lamp of the body. Therefore if your eye is good, your whole body will be full of light..
6:23 But if your eye is bad, your body will be full of darkness. If therefore the light that is in you is darkness, how great is the darkness! 6:25 “So I say to you, do not worry about your life—what you will eat or drink, or about your body, what you will wear. Isn’t life more than food and the body more than clothing? 6:26 Look at the birds of the air. They do not sow or reap or gather into barns; yet your Father in heaven feeds them. Are you not of more value than they? 6:27 And which of you by worrying can add a single hour to his life? 6:28 And why do you worry about clothing? Consider the lilies of the field, how they grow. They neither toil nor spin. 6:29 Yet I tell you that not even Shlomo in all his glory clothed himself like one of these. 6:30 Wherefore, if Elohim (אלהים) so clothe the grass of the field, which to day is, and to morrow is cast into the oven, [shall he] not much more [clothe] you, O you of little faith? 6:32 (For after all these things do the Goyim seek:) for your heavenly Father knows that you have need of all these things. 6:33 But seek first the kingdom of Elohim and His Tzidkat (righteousness), and all these things shall be added to you. hab lan yoma deyn umachra.